Sanders Wails On State TV About "Disgusting, Disloyal" Leakers: We'll Find Them And We'll Fire Them [VIDEO] - Joe.My.God. White House press secretary Sarah Huckabee Sanders on Wednesday said that so-called “leakers” in the West Wing should be fired. During an interview on Fox News, Sanders called it “disgusting” and “disloyal” to reveal internal discussions to the news media and said the White House is “focused intensely” on putting a stop to the practice. 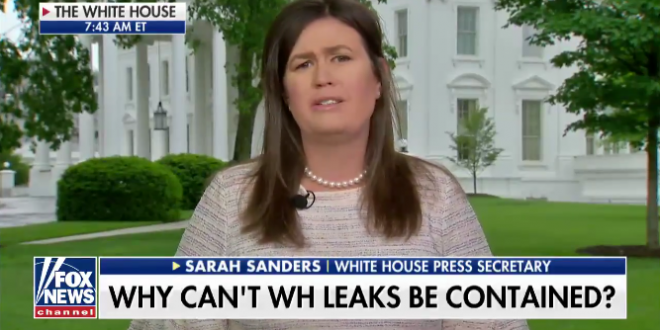 “We fired people over leaking before — I’ve personally fired people over leaking before — and we certainly would be very willing to do so again,” Sanders told the hosts of “Fox and Friends,” one of President Trump’s favorite television shows.